Samsung’s 2017 acquisition of renowned audio specialists Harmon Kardon has now produced two new Cinematic soundbars, the HW-Q70R and the HW-Q60R. Both soundbars incorporate new technologies borne out of the new collaboration, namely Samsung’s Acoustic Beam technology and the new Adaptive Sound feature. The HW-Q70R further distinguishes itself with compatibility for object based 3D sound in the form of support for Dolby Atmos and DTS:X surround sound protocols. Adaptive Sound technology analyses the content being played on the TV and dynamically adjusts the associated audio to create real time optimisation in order to present the best possible audio output for each scene. Although the Q70R and Q60R can be used with most modern TVs, if either is connected to one of Samsung’s 2019 QLED TVs the Adaptive Sound feature is automatically enabled for a more streamlined user experience. The other feature both soundbars are equipped with is Acoustic Beam technology. This uses a panoply of fine apertures through which the sound passes, resulting in an enhanced, wider soundfield. The HW-Q70R itself is a dainty 59mm in height and each soundbar is accompanied by a slimline, wireless subwoofer and can be connected to additional wireless surround speakers. Other connectivity comes courtesy of USB and also Bluetooth, so music can be played from phones or tablets. 4K passthrough is also available when using a 4K source, such as a UHD Blu-ray player. The HW-Q60R soundbar is available now from Samsung and selected retailers (RRP: £599.99). The HW-Q70R soundbar will be available in April (RRP: £799.99). 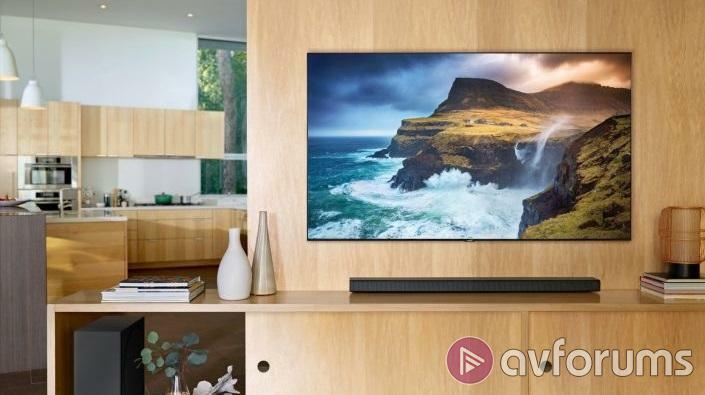 With the immersive Dolby Atmos and DTS:X sound protocols only previously available on the high-end HW-N950 and HW-N850 soundbars, the new HW-Q70R provides a more reasonable entry point for those wishing to add 3D sound to their existing setup, albeit without the voice control of Alexa and Google Assistant that comes with the more expensive range.